Crisp acidity with a silky mouthfeel. This white wine has a subtle touch of oak with mineral hints and a classic, long finish. A truely wonderful Chardonnay from Burgundy. Pouilly-Fuissé marks the southern end of the famous limestone plateau that forms the bedrock to all of Burgundy’s vineyards. As if to emphasise this, two dramatic limestone escarpments stand across from each other like gate towers. Their sheer cliff faces are reminiscent of Benbulbin in Co. Sligo. At the foot of one of these outcrops is the winery of Roger and Christine Saumaize-Michelin. Roger is the winemaker and on meeting him one is as likely to think him a crazed artist as anything else. Passionate rants about biodynamics (an energy based approach to organic farming which he practices) or various wine techniques are illuminated by wild hand gestures and contorted expressions. As he showed us around his beautiful old winery, one couldn’t help but notice that this was a man at one with nature and proud of his craft. This is wine made at nature's pace. Grapes are handpicked and sorted and the press is a gentle, slow process. Wines are usually fermented in oak and aged for a year before bottling but he was keen to point out that he lets the wine dictate how and where it is fermented and matured. It’s as if he makes wine by feel, an intuitive approach that is refreshing in a world of industrial systems. Christine is the manager and keeps Roger’s creative mind focussed, no easy task. 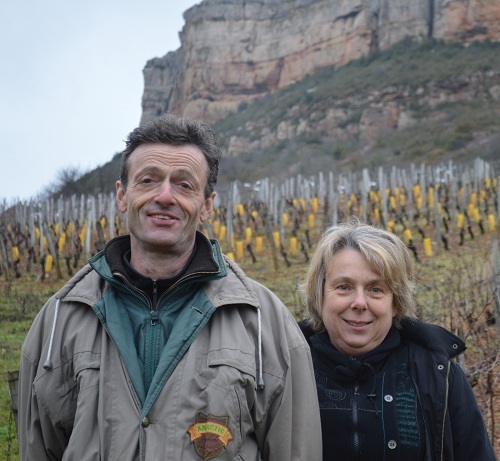 We’ve yet to meet a more complementary couple making wine and it is a pleasure to be in their company. Their sheer passion and joy for life shines through their fantastic range of Pouilly-Fuissé, all of which are as expressive as Roger himself. "Fragrant elderflower nose with a hint of oatmeal. Sensitive oaking has bestowed a faint vanilla fragrance, with peaches on the palate." 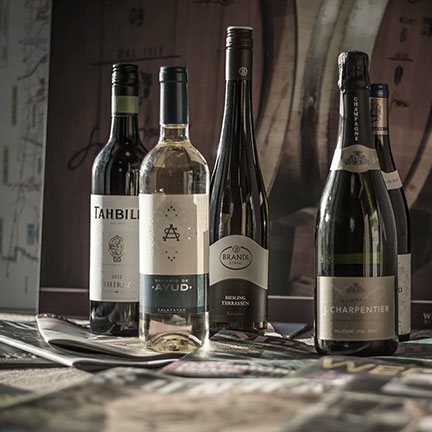 Sunday Times Wine Companion 2013. "Classy gently nutty nose, plus oatmeal and cream. Palate is rich yet fresh with a mandarin-zest finish." "Smart and tasty with hazelnuts, butterscotch and the merest sniff of sea salt. A smooth, substantial mouth feel offset by refreshing acidity." "A classy wine with a hazelnut and honey nose, creamy rich texture and fresh, clean finish." Pouilly-Fuissé marks the southern end of the famous limestone plateau that forms the bedrock to all of Burgundys vineyards. As if to emphasise this, two dramatic limestone escarpments stand across from each other like gate towers. Their sheer cliff faces are reminiscent of Benbulbin in Co. Sligo. At the foot of one of these outcrops is the winery of Roger and Christine Saumaize-Michelin.